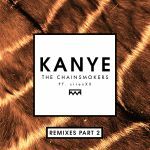 Die CHAINSMOKERS: jetzt der Fan-Club von Kanye West ... irgendwie eine Verarsche ... ich kann mir nicht helfen ... aber mit ICONA POP Touch und Beats. Wow, this is completely different to #SELFIE. Good, but I definitely prefer "#Selfie". I unexpectedly liked this. A big improvement on "#SELFIE".<br><br>The name drop is a bit awkward for me, without it it would be 4*.<br><br>3.5*. Hahaha. The thing that interested me from first listen is the lyrics. Of course you always see complaints about Kanye and his distasteful behaviour, and the subsequent trashing of him and his music. Even if it comes across as highlighting some egotistical characteristics, I do find it amusing that looking at the lyrics at face value the singer wants to actually be like Kanye and that they're complimenting him. 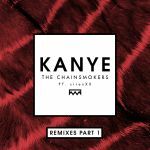 That being said, according to The Chainsmokers themselves it's "less about Kanye West and more about being the person you want to be and not letting anyone take that from you". Either way, props to The Chainsmokers for the lyrics. Aside from that, the production is appealing and I like that it's totally different from "#SELFIE". The vocals are nice too. Even though I charted "#SELFIE" much better, I think this is at a similar level of quality to that. Un successeur surprenant à "#SELFIE". Ça fonctionne très bien pour moi ! Sehr nett, Siren sei Dank. Kindchen hudligt einem Vorbild. Was kann denn so cool an Kanye sein? Sowas finde ich nicht cool.